This book will draw on three volumes in the series 'Makers of the Modern World: The Peace Conferences of 1919-23 and their Aftermath'; namely, T.G. Fraser, Chaim Weizmann. The Zionist Dream; Andrew Mango, Turkey, From the Sultan to Atatük, and Robert McNamara, The Hashemites. The Dream of Arabia. It will also include new material, bringing these volumes together. 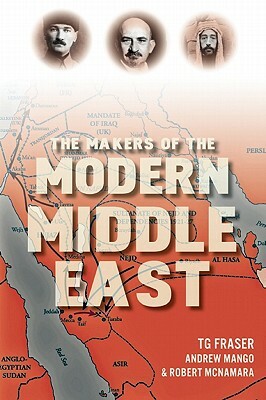 Its purpose is to present a comprehensive analysis of how the decisions taken at the end of the First World War forged a new Middle East, setting in place a pattern which formed the political shape of the region as we know it today. Based upon original research and recent interpretations, it explores the complex interactions of the high politics of the conferences with how Arabs, Jews and Turks created new realities on the ground, often confounding what the statesmen had decided. With events in the Middle East rarely absent from the world's headlines, the book will offer a scholarly and objective analysis of a critical phase in its development. The volume will conclude with an overview of the contemporary Middle East in the context of the decisions taken at the end of the First World War. T. G. Fraser is professor emeritus at Ulster University. A fellow of the Royal Historical Society, Royal Society of Arts, and the Royal Asiatic Society, he is the author of The Arab-Israeli Conflict and Chaim Weizmann: The Zionist Dream, the latter published by Haus.